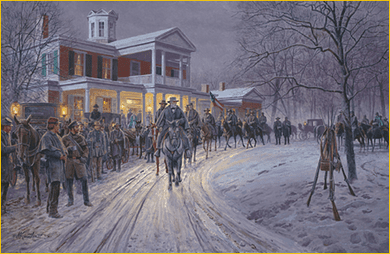 Mort Kunstler Hand Signed & Numbered Limited Edition Print: "Merry Christmas General Lee"
Overall Size: 23 3/4" x 34 1/2" Image: 17 3/4" x 29 1/2"
Edition:Artist Hand Signed and Numbered Limited Edition to 500, Artist Proofs to 50 / Canvas to 100. COA included. Frame: Fine Art on Paper (Lithograph) and Canvas. Artist Comments: I believe "Merry Christmas General Lee" records a fascinating historical event that occurred at a special time of year and in a most attractive, memorable setting. And - it's a fitting final tribute to General Robert E. Lee at the conclusion of his 200th birthday year. In 1862, General Stonewall Jackson made his headquarters at an outbuilding at Moss Neck Manor near Fredericksburg, Virginia. In 1995, I featured the manor house in a painting entitled Review at Moss Neck, which depicted a review of the troops by Generals Lee, Jackson, James Longstreet and J.E.B. Stuart. The manor is such a stately structure - I enjoyed painting it immensely, and have wanted to paint it again ever since. I learned that General Jackson's stay at Moss Neck continued through the Christmas season of 1862, and while there he hosted a holiday dinner for General Lee and other officers. It was the perfect combination: a fascinating, little-known historical event that occurred at a picturesque, memorable location - Moss Neck Manor. As I made inquiries to research the event, I was invited to visit Moss Neck and tour the magnificent house. I examined every angle, and studied the historical event in detail. The Corbin family, who resided at Moss Neck, hosted a Christmas party after General Jackson's dinner. General Lee returned to his headquarters after the dinner, and I chose to paint the moment that he departed - while guests were arriving for the Christmas party at the manor house. Focusing on that moment of the evening allowed me to paint a wonderful combination of military and civilian figures and activities. The Corbin's Virginia neighbors, dressed in their wartime best, were arriving - as General Lee and members of his staff were leaving. General Lee, of course, is the focus of the painting - along with the antebellum Old South architecture of Moss Neck Manor. I used various artistic devices to call attention to Lee as the center of interest. For instance, the carriage tracks lead toward Lee almost like an arrow. The tree branches also lead the viewer's eyes toward him. Undoubtedly someone greeted General Lee with a season's greeting that evening, which inspired the title I chose - "Merry Christmas General Lee." The violet-blue evening sky and the frosty breath of the men and horses show the winter conditions that prevailed. It was a gala event and a heartwarming scene - one which surely provided Lee, Jackson and all present with emotional encouragement and the warmth of the season among the cold, hard realities of the Civil War.